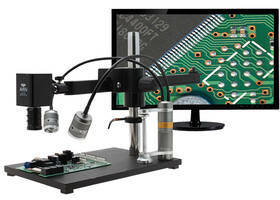 Aven’s Ultra-Glide Arm Stand System is ideal for inspecting parts over a large surface area. The Ultra-Glide Arm Stand provides smooth motion along its 23-inch arm, allowing for easy scanning. The stand features a 13.5-inch post with a safety collar and a heavy 10.5in x 15in base. This system features Aven’s Mighty Cam Auto Focus inspection camera. Frequently re-adjusting the optics of an inspection system can take up valuable time, as well as lead to wear and tear of the physical components of the system. Aven’s Mighty Cam Auto Focus camera streamlines the inspection process by achieving instant auto focus, with no need to manually adjust the physical optics. Includes a 32gb Micro SD card for capturing high resolution image/video files, with no computer required. This system utilizes a macro zoom lens, providing 6x-18x magnification at a 6-inch working distance / 32x-52x at a 0.39in working distance, based on a 22-inch monitor. The Mighty Cam Auto Focus is ideal for inspecting objects with multiple focal points, such as PCBs and other layered objects. Simply position the object to the sensor box on the screen and the camera will instantly achieve a focused image. Comes complete with a 32gb Micro SD card, USB SD card adapter, HDMI cable, and power supply. Aven, Inc. manufactures and distributes high-performance optical instruments and precision tools for microscopy, inspection and assembly. A technology innovator since 1983, Aven is located in a high-tech corridor of Southeast Michigan. 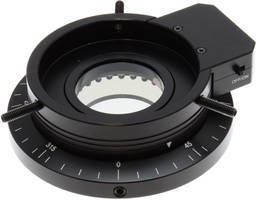 Aven's LED Ring Light features adjustable polarizer dial. 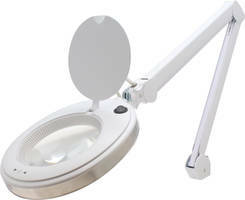 ProVue Solas Magnifying Lamps feature fastening ring for switching out lenses. 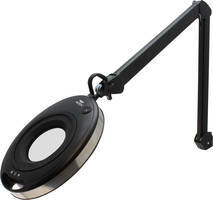 Aven's LED Task Light features adjustable focus ring. Reel Stand features 6,000 lb capacity. Microphone Array Stand holds up to 16 microphones.